There's more to it than just a destination. Man, when I get creative, it’s good times. 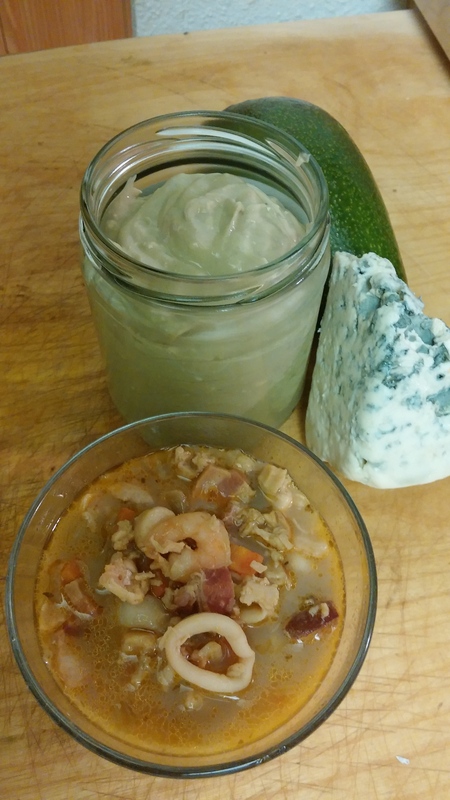 So – I wanted to make more paleo clam chowder tonight and I took my grama’s recipe base and started from there. But then!…mom brought over a bag of seafood medley from TJ’s that had calamari, shrimp, clams, etc. So I added that to my can of clams. I used mushroom broth and the canned clam broth in this one: still delish. I also used a can of separated coconut milk (dumped out the liquid, just spooned out the hardened coconut fat), instead of cream. And then I forgot to add the cauliflower for the “potatoes”, but it turned out perfect without it. Also future note: the chili powder I used this time was chili chipotle which added a little heat, and that was awesome. And you thought I would stop there? I was REALLY craving a salad (soup and salad, anyone?) with some blue cheese dressing, but since dairy hasn’t been my friend lately, I needed to make my own dressing. Enter: avocado (again). Homemade blue cheese dressing: whipped avocado, coconut milk, olive oil and raw blue cheese (apparently if you have a hard time with dairy, raw dairy doesn’t hurt you as badly. We’ll see how I feel tomorrow). Other than the dressing being green (it isn’t easy being green), it tastes and looks EXACTLY like a really good homemade/restaurant quality blue cheese dressing. Something tells me this will be delicious….